Amanda Murphy Design: It's here! 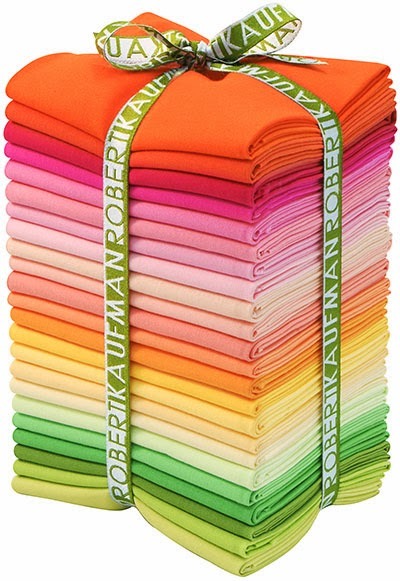 Color Essentials! I'm so excited to finally show you all my second book, Color Essentials: Crisp and Vibrant Quilts! 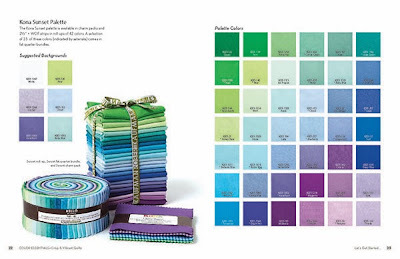 Color Essentials is a book I've dreamt about for a long time. 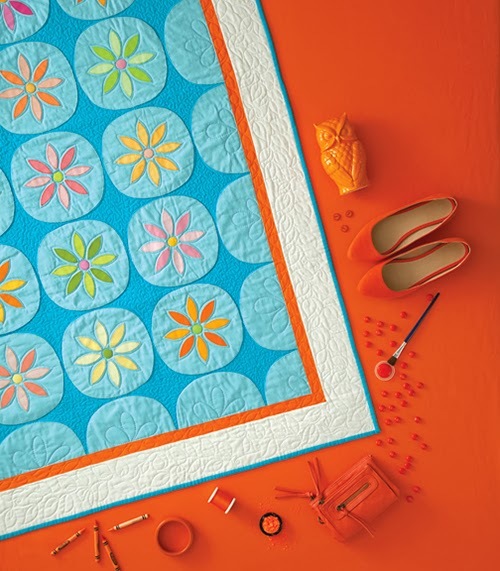 It straddles the worlds of quilting and graphic design - two things I'm passionate about. Color was my favorite class in college and it is my favorite part of designing fabrics and quilts. I love exploring the ways colors interact with each other and make the same design appear wildly different. 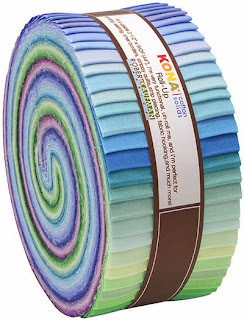 In Color Essentials I cover the basics of color theory using Kona cotton solids and Aurifil threads and I provide some tips for stepping out of your color comfort zone to create something new. 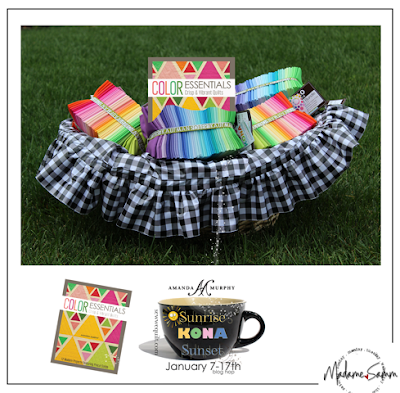 I hope that this book inspires you to try something you've never tried before with color! I want to thank all the people at C&T Publishing for taking a chance with this book. Since it straddles the line between art and design it is a different type of book than you usually see - and C&T's fabulous design team made it look like a museum catalog from cover to cover just as I'd envisioned. Because quilting is an art… our art, and beautifully colored fabrics are our palette. 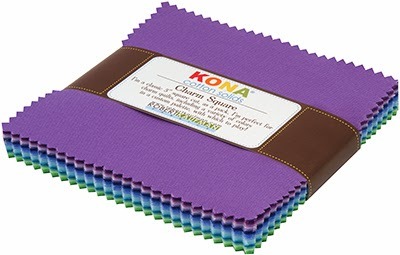 The charm squares and roll-ups each contain 42 colors and the fat quarter bundles contain 23 colors. I love them! 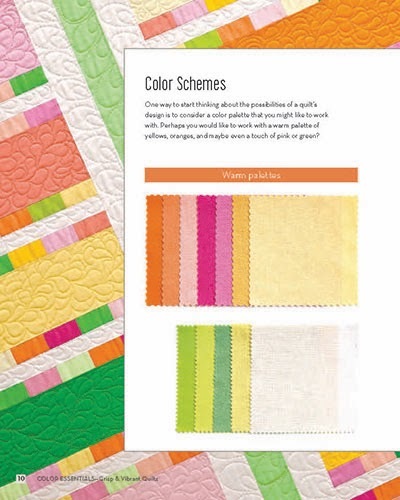 You can use these precuts for nearly all the projects in the book simply by adding background and border fabric! To make things easy, I have included a spread in Color Essentials dedicated to each palette in turn, showing all its colors as well as suggested backgrounds. But you shouldn't feel like you have to stick to those backgrounds - have fun with it and feel free to explore! 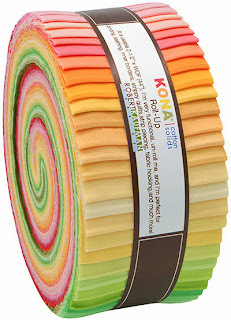 And here's the best part - we are all going to get to play with color TOGETHER because the fabulous Madame Samm will be hosting one of her wonderful blog hops at Sew We Quilt January 7th-17th featuring projects made with these fabrics - they can be a project from the pages of Color Essentials or they can simply be inspired by the colors found there. I'm so excited to see what you all create!!!! Really - this is the most gratifying part to me as a designer. So if you are interested head on over to Sew We Quilt and sign up for a spot on the blog hop. The January date gives us plenty of time to experiment. 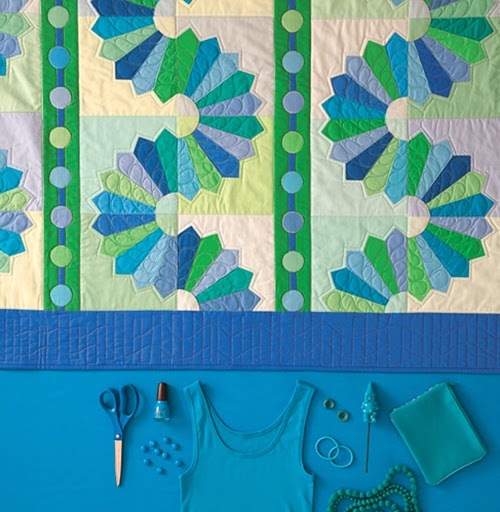 And while you are over there take a sneak peek at the Aurifil thread box that Madame Samm put together to coordinate with the projects in Color Essentials. It is BEAUTIFUL! While I wait for mine I thought I'd share the colors included there with you courtesy of Madame Samm. They are: 1216, 1482, 1228, 189, 1706, 1392 , 357, 1285, 152, 1513, 1173, and 184. 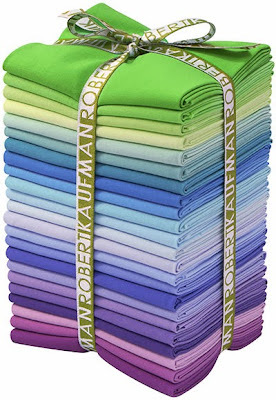 I did use many of these same threads in the projects in the book (so much so I've very little left to show) - in case you plan to order any I like 28 wt. for appliqué and 50 wt. 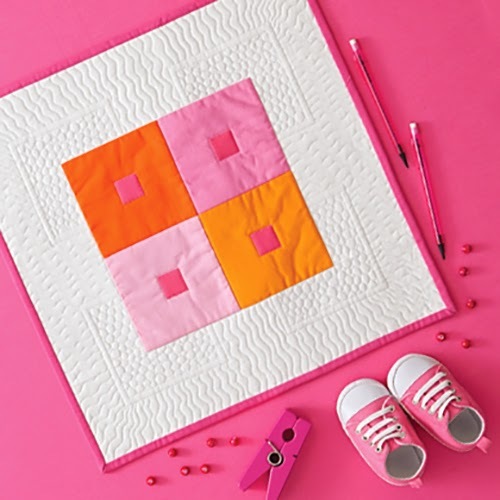 for piecing. The entire book was sewn on the Bernina 580 - I love that machine! It is a real work horse and can do so, so many things. 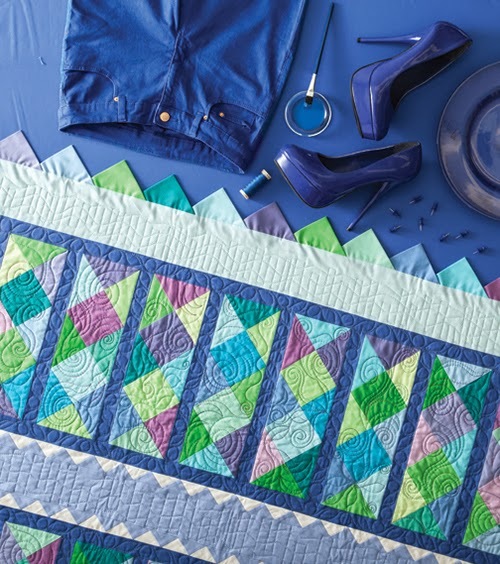 And the large projects were quilted beautifully by Deborah Norris. Thanks, Deborah! Goodness, what else? Oh yes, I now have advance copies of Color Essentials in my store if you are interested. I ship to the U.S. and Canada at this point and there is free shipping in the U.S.. For international customers, please contact your nearest shop - they should be able to place an order with C&T or with a distributors. I hope you like Color Essentials! Happy quilting and have a wonderful weekend! P.S. For shops… I do not take wholesale orders but feel free to order a book to make samples if you are interested. Wholesale orders can be placed through C&T Publishing or any of the major distributors. It will start shipping later this month. 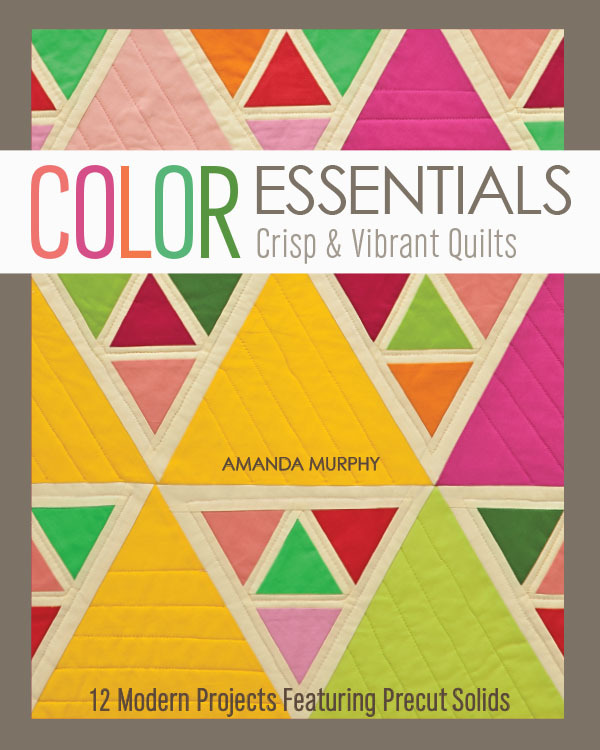 exciting book amanda...more and more im drawn to working with solids only. excited to see the projects! This looks like such a fun book. And I LOVE your fq sets you made. They are just gorgeous. Ooooh, I am excited about your book. Congrats. The pictures here look like it is a true masterpiece, full of eye candy and great design. Your color combinations are so enticing. Looks inspiring. Congrats on the new book Amanda and love the fabrics! Congratulations…what a beautiful book and the fabric colors are amazing!!! wow! 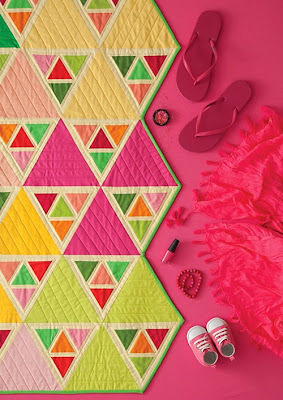 those quilts are amazing. that hop should be fun to see. Ordered your book and can not wait to get it! Love the designs and colors you put together. 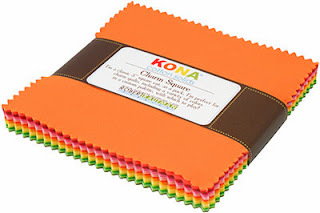 Are these Kona sets in stores now?